Considered a superstar of the architectural world, Zaha Hadid is internationally recognized for her ingenuity. Her bold, but elegant designs transform landscapes with “twisting dynamics,” curving lines, organic forms, and a “sensuous layering” of materials. [ii] These are often futuristic creations that feel as if they are plucked right out of a science fiction movie. 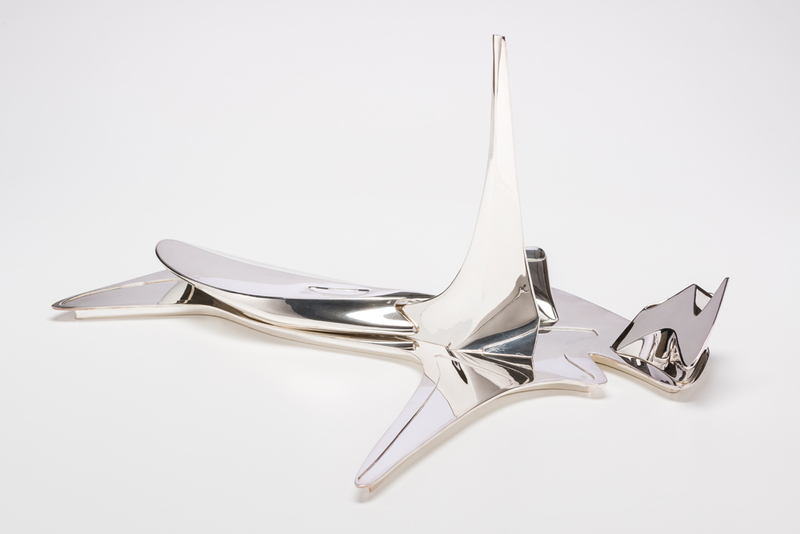 The Kamm Teapot Foundation has two examples of Hadid’s work. Both designs explore the concept of the tea and coffee set. One is for Sawaya & Moroni and the other, which is our focus here, was created for Alessi. This design is part of a group of limited-edition experiments done by the company. [xi] First initiated in 1980, Alessi engaged a group of eleven architects to explore the creation of silver beverage services. Many giants of architecture such as Michael Graves and Robert Venturi were among the participants. [xii] Their work expressed a “stylized neoclassical vocabulary” and “turned teatime tabletops into miniature postmodernist villages.”[xiii] For this reason these creations earned the name Tea and Coffee Piazzas. In 2003 Alessi revitalized the venture choosing twenty-two architects from ten countries. Hadid and the other chosen participants, such as Toyo Ito and Thom Mayne, were tasked with the creation of a service that included a sugar bowl, milk pitcher, and tray. Selections from the final collection were first exhibited in Milan, Italy. Aesthetically the Tea and Coffee Piazza is reflective of Hadid’s architectural projects. The highly polished smooth structure, which appears to be caught morphing or changing shape, contains fluid lines, rounded forms, and an elegant futuristic sense of style. It also plays with strong horizontal and vertical components. Of the Piazza, Hadid identified the teapot as a “wide, flat, organic shape” and said the “coffee pot rises from the landscape like a tower.”[xviii] These contrasting features create a tension within the work. Unequivocally, with this design, Hadid is breaking all the traditional rules associated with the construction and appearance of a tea and coffee service. Over the course of Hadid’s career she created numerous, dramatic, one-of-a-kind buildings. Noteworthy examples include Guangzhou Opera House in China (2010) and the London Aquatics Center for the 2012 Olympics. She also branched out designing products such as furniture, shoes, and lines of jewelry. In the latter portion of her life Hadid received many accolades for her architecture. She won the Stirling Prize twice (2010, 2011), the Royal Gold Medal (2016), and in 2012 Queen Elizabeth II made her a Dame Commander of the Order of the British Empire. [xix] One of her highest honors came in 2004 when Hadid was awarded the Pritzker Prize. Considered the Nobel Prize of architecture, she was the youngest person and first woman to be honored with this recognition. Betsky, Aaron. The Complete Zaha Hadid. London: Thames & Hudson, 2017. Jodidio, Philip. Building the Future: Zaha Hadid, Giver of Forms. Köln, Germany: Taschen, 2013. Lewis, Anna M. Women of Steel, 22 Inspiring Architects, Engineers, and Landscape Designers. Chicago, IL: Chicago Review Press, 2014. Parsons, Roger. Zaha Hadid: Who Dares Wins. BBC World News, 2013. Scarzella, Patrizia. Tea and Coffee Piazza. Crusinallo, Italy: Alessi, 1983. Zaha Hadid Architects. Zaha Hadid Architects: Redefining Architecture and Design. Mulgrave/Melbourne, Australia: The Images Publishing Group, 2017. [ii] http://www.famous-architects.org/zaha-hadid, September 15, 2018. [iii] Hadid’s father, Muhammad al-Haji Husayn, was a politician and industrialist. He was also co-founder of the National Democratic Party in Iraq. Her mother, Wajiha, was an artist. [iv] The Catholic school Hadid attended also had French and Jewish students. [v] https://www.notablebiographies.com/newsmakers2/2005-Fo-La/Hadid-Zaha, September 14, 2018. Hadid originally said this in an interview with Newsweek ‘s Cathleen McGuigan. [vi] Sumerian architecture is considered the earliest monumental architecture in the world. People living between the Tigris and the Euphrates rivers began to build large substantial buildings in approximately 3500 BC. [viii] Hadid’s family also left Iraq for London. Saddam Hussein’s rise in power and the outbreak of war with neighboring Iran were the reasons for their departure. Hadid eventually became a British citizen. [ix]Oliver Wainwright, “Zaha Hadid: Creator of Ambitious Wonders – and a Fair Share of Blunders,” The Guardian, March 31, 2016, https://www.theguardian.com/artanddesign/2016/mar/31/zaha-hadid-maverick-architect-designer-appreciation. [x] Anna M. Lewis, Women of Steel, 22 Inspiring Architects, Engineers, and Landscape Designers, Chicago, IL: Chicago Review Press, 2014, 84. [xi] The concept for the first group of designs was based on an idea from Alessandro Mendini. This second installment was orchestrated by Alberto Alessi. 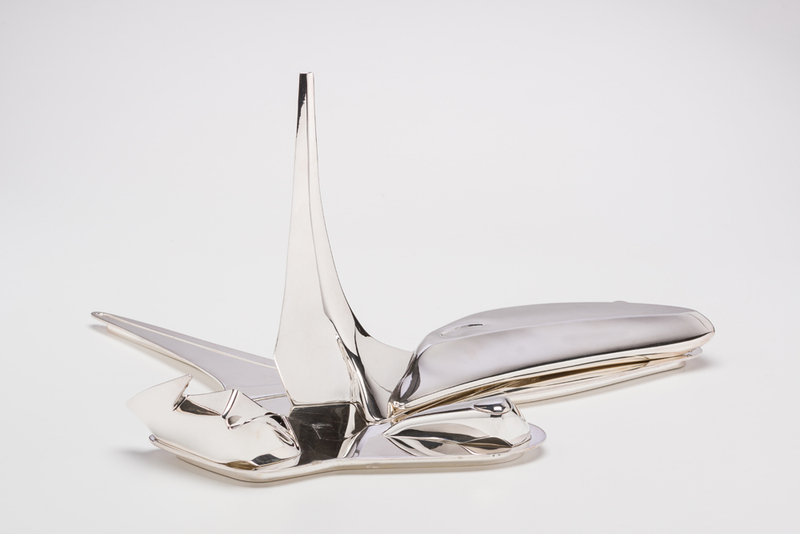 Ninety-nine editions were produced of Zaha Hadid’s Tea and Coffee Piazza. [xii] The Kamm Teapot Foundation has within its collection Tea and Coffee Piazzas by Michael Graves, Charles Alexander Jencks, Paolo Portoghesi, Aldo Rossi, and Hans Hollein as well as lithographs that illustrate various designs from this original Alessi project. 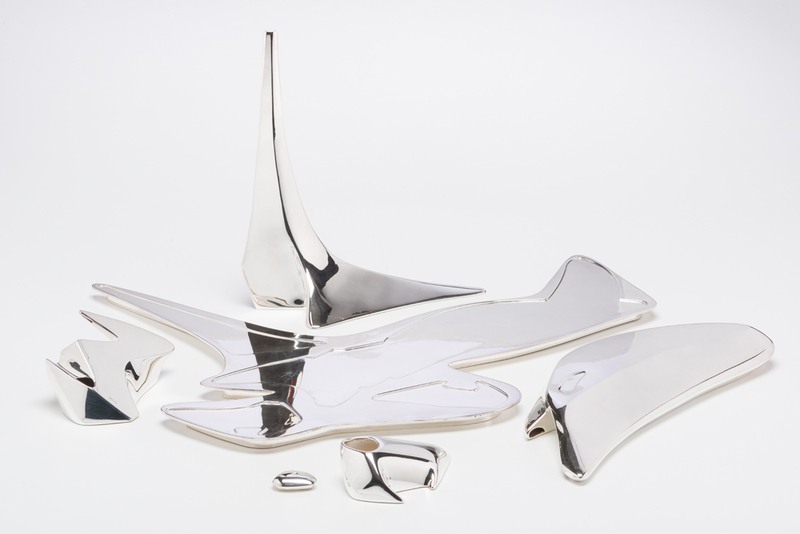 [xvi] https://bumo.wordpress.com/2009/11/27/silver-tea-coffee-tower-set-by-zaha-hadid-for-alessi, November 27, 2009. [xvii] Aaron Betsky. The Complete Zaha Hadid. London: Thames & Hudson, 2017, 263. [xix] The Royal Institute of British Architects Stirling Prize is a British prize for excellence in architecture. It is named after the architect James Stirling and is organized and awarded annually by the Royal Institute of British Architects (RIBA). The Royal Gold Medal for architecture is awarded annually by the Royal Institute of British Architects on behalf of the British monarch, in recognition of an individual’s or group’s substantial contribution to international architecture.